Our God created emotions and feelings, and He obviously has some strong ones. The children of Israel were the recipients of His anger and wrath on more than one occasion. I don’t believe any of us would purposefully choose to get on the wrong side of the Lord’s “hate” list. But consider this: The Lord reserves much more volatile words than “hate” to describe how He feels toward the acts most damaging in the kingdom of God, acts such as sexual sin, idol worship and the love of evil. God uses words such as “loathsome,” “detestable” and “abominable” for these actions. Oh, by the way—these are the very words God uses to describe those who sow discord among the brethren (Prov. 6:16-19). So what’s the big deal with complaining, gossiping, judging, criticizing or being sarcastic about others in a place where Christians work, such as churches, Christian schools, Christian businesses or parachurch organizations? I mean, everyone does it, right? Who doesn’t criticize leadership? It would be un-American not to gripe about the boss. Long before Stephen Covey’s habit six (synergy) in the 7 Habits of Highly Effective People or John Maxwell’s The 17 Indisputable Laws of Teamwork, the Lord established that unity is powerful. The fullness of the power of the Holy Spirit is unleashed through unity. Unity in the Christian workplace sets all things in order; it brings efficiency, peace and a teamwork that transcends anything theorists write about or researchers validate. And in any Christian setting, unity frees leadership to practice spiritual discernment. Here’s why complaints, gossip, judgment, criticism and sarcasm are so damaging: these words and actions defeat God’s primary purpose: unity among believers. You see, Satan is always out to destroy God’s essential purpose. Christ’s vision for us as believers is that we might be one as He and the Father are one and that we be one with Him (John 17:11-23). Satan exploits these words and actions of complaining, gossip, judgments, criticism and sarcasm in the Christian workplace to keep the purposes of God at bay. When you judge others, you are playing God. You second-guess others, thinking you know their intentions. You ascribe value to others with your standard being the litmus test for worth. Who are you to determine someone’s worth? Truth be told, you don’t know your own heart or motivations, much less others’ (Jer. 17:9–10, Ps. 139:23, 24). We need to reserve judgment for the Lord, who knows our hearts. In a Christian workplace where unity is practiced, people can listen to each other without judging. They can pray out of a pure heart, one that is not full of criticism. Criticism destroys trust, the basis for any relationship. Because we are spiritual beings and the ways of the Spirit operate in the unseen, secret criticism is every bit as destructive as openly critical words. Criticism or secret criticism prohibits honesty and authenticity. We don’t “right-size” the impact of criticism, sarcasm or judgment toward the boss, colleagues or clients. Unfortunately, we fall into the world’s trap and target authority figures at any level with these words. I’m praying you let what is written next sink deep into your soul. We are to pray for those in authority, not complain, berate and criticize (1 Tim. 2:1-2). When we do these harmful things instead of praying and supporting leaders, we damage God’s kingdom. And we are just like the world. To make it more personal, when we switch into complaining mode, we send a clear message to God: “I don’t trust you; I don’t believe you are in control.” We strike at the very heart of God—we don’t believe that God’s very nature is good. We don’t believe He can use all things for good. When we complain, we create an atmosphere around us that cannot host the presence of the Lord. We push against God’ entrance into our workplace while others are praying for His presence. Complaining is akin to emotional air pollution: It pollutes the air we breathe. 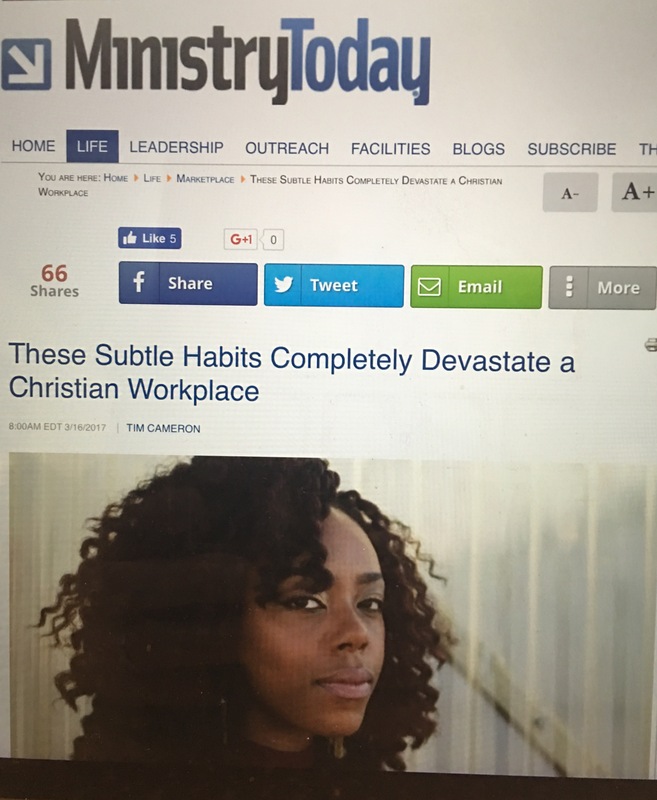 Gossip in the Christian workplace? Unheard of! Nevertheless, it is alive and well in many circles. The words of gossip are wicked because they carry such great negative, destructive power. Gossip inflicts greater damage that lasts longer and spreads farther than complaining, criticism, judgments and sarcasm. It is the king of the verbal sin domain. The antithesis of complaining, sarcasm, criticism, gossip and judgment is the unity of the Spirit. If you have ever experienced the sweet fellowship of the Spirit with other Christian brothers and sisters, you know what it would be like to have this same Spirit in the Christian workplace. Unity is God’s essential purpose for everyone who works there. However, unity in the workplace isn’t easy. It requires a commitment to vulnerability, transparency and determination to strive for it. Unity requires a full measure of truth and mercy (Ps. 25:10). Once you experience unity in the workplace with other Christians, you will never be satisfied with anything less for the rest of your working life. Now, go contend for it! Tim Cameron is a passionate follower of Jesus, a father of five, with six grandchildren and two goddaughters. He graduated from Oral Roberts University, where he was a Division-1 basketball player, and completed graduate work at the University of Tulsa. Tim worked at ORU as director of admissions and financial aid. Following his tenure there, he was a public high school principal and then served as head of school at the largest private school in Oklahoma. Tim currently writes, speaks and serves in intercession and prophetic ministry at Believers Church in Tulsa. He has a great passion for prayer. He authored The Forty-Day Word Fast and has a second book coming out with Charisma this June, 40 Days Through the Prayers of Jesus: A Journey to Pray More Like Christ.